What you DON’T KNOW about everyday foods could kill you . . . cure you . . . energize, supersize, glamorize, or slenderize you. Now the top doctors in women’s healthcare help you make all the right choices – effortlessly. You have 12 ISSUES of Women’s Nutrition Connection reserved in your name. May I send them to you? If you’re like most smart women in the prime of life . . .
You already know the right foods play a huge role in how good you look and feel. How long you live. Even help you dodge the bullet of serious disease. The problem is . . . the “right” foods and lifestyle choices seem to change as often as the wind in the tropics. Of course, that’s a good thing. Because each new scientific discovery fine-tunes and advances your good health. But you’d need a full-time doctor, nutritionist, personal trainer, plus an array of medical specialists to keep up – and make sense of it all. And that’s exactly what you’ll find in Women’s Nutrition Connection. We’ve put together a top team of medical and fitness experts drawn from every vital discipline in women’s healthcare at the prestigious Weill Cornell Medical College. All so YOU can harness the healing power of nutrition and fitness in your own life – easily, efficiently, effortlessly. I’d like to send you the next 12 exciting issues of Women’s Nutrition Connection with my personal satisfaction guarantee. There’s no risk in subscribing. I’m offering a 100%, money-back guarantee! Just to give you the chance to see first-hand what leading experts in women’s health recommend for you . . . the best food and lifestyle choices you can make right now to get fit fast and stay healthy for life. Foil cancer with food. New research shows a plate full of vegetables, fruits, and whole grains can slash your risk for breast, ovarian, and colon cancer. Take aim against trans fats to save your heart. Even if the label says “trans fat free,” a legal loophole means it could contain .5 grams per serving. Look for this tell-tale ingredient – and you’ll know the true story. Couch potato uprising. Watch two hours of TV and walk around the house during the commercials – you’ll get 30 minutes of exercise! Caesar shocker. Unless it says “heart healthy” on the menu, chicken Caesar salad can weigh in at a hefty 800 calories – a third more than a Big Mac. Avoid weight gain – even if you sometimes eat high-fat foods. A recent study shows regular exercise helps the body fire up metabolism more quickly to adjust for an increase in fat intake. I’m sure you’ve noticed that there’s often a significant delay between scientific breakthroughs – and when the public gets the news. Now you don’t have to wait for important findings to trickle down to the general media. Even better, you don’t have to puzzle out what your local newspaper or TV reporter is talking about – or wonder if they even got it right. Fight Back with Your Fork! Women's Nutrition Connection shows you the power proper eating has over your health, wellness and disease prevention. Learn more, risk-free! Women’s Nutrition Connection closes the information gap. From science lab to your lips – you get the newest, the latest, the most important food news piping hot! Is any topic more critical to your health? After all, every meal, every snack, every morsel you eat goes directly to your heart, your hips, even your hair. Imagine how much time you’ll save – and how confident you’ll feel – with expert advice from the doctors and researchers at Weill Cornell Medical College. FIGHT BACK WITH YOUR FORK. STOP DISEASE WITH YOUR DINNER. Make no mistake about it, heart disease, cancer, and stroke are gunning for YOU. These top three killers of women account for nearly 60% of all female deaths in the U.S. Scary as it sounds, that’s actually good news. Because there’s so much you can do to swing the odds in your favor. Trust Women’s Nutrition Connection to bring you specific recommendations on the health issues that concern you most . . . breast cancer, weight loss, menopause, high cholesterol, Alzheimer’s, arthritis, and more. Cut your risk of colon cancer with calcium. Eat plenty of low-fat dairy products – and make sure your supplement includes this essential vitamin. Grapefruit WARNING! If you’re taking statins to lower cholesterol, grapefruit (even juice) could trigger muscle damage. Check Women’s Nutrition Connection for other dangerous food-drug combinations. Soothe aching joints and relieve stiffness with these simple exercises anyone can do. Fortify your heart with flavonoids. These natural antioxidants – found in berries, onions, tomatoes and other foods – protect against cell damage and DNA damage. Outsmart food cravings with the sneaky “5-15 strategy” that defuses the urge to overeat. Spice up breast cancer protection with turmeric. Studies at Cornell show this common curry spice induces cell suicide in breast cancer cells. 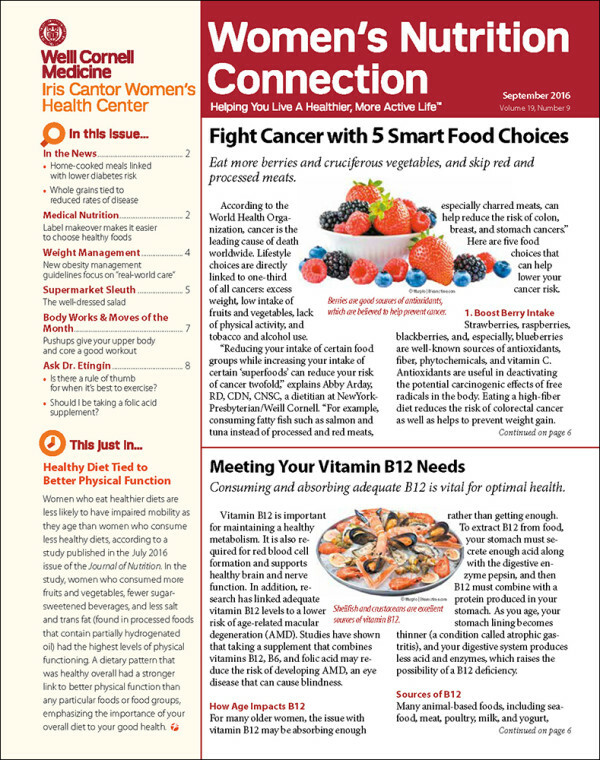 You’ll find so much ready-to-use information in Women’s Nutrition Connection, it’s easy to take your diet from iffy to healthy in just one issue. Send for your 3 FREE ISSUES today and see for yourself. THE “MAGIC BULLET” FOR WEIGHT LOSS, LONGER LIFE, AND HEART HEALTH. Yes, there really is a “magic bullet,” and the rewards go far beyond weight loss and longer life. Once you discover it, you’ll also improve your appearance . . . and reduce your risk of cancer, diabetes, and osteoporosis. In fact, if all the “magic bullet” benefits were available in a pill . . . every woman in America would be begging her doctor for a prescription. But unlike so many pills, the “magic bullet” has no unpleasant side effects, no dangerous interactions. It’s quite literally all good. As you’ve probably guessed, I’m talking about regular exercise. And that’s another area where you’ll find Women’s Nutrition Connection so eye-opening and helpful. Ease neck and back pain (and look thinner) with good posture. Three simple exercises make it easy to stand taller. Fun is the secret motivator that keeps you coming back. Try these tips to build fun and friends into a just-for-you program you’ll stick with. Won’t dance? Hate to jog? Try power yoga . . . cardio stretch . . . or aqua walking – just a few of the many fun-to-do aerobic workouts you’ll find at your local gym or YMCA. Bone up on these easy weight-bearing exercises. Even if you already have osteoporosis, they’re safe for you. Run away from breast cancer. New studies show postmenopausal women with high physical activity levels have a 14% lower risk of developing breast cancer. No matter what your activity level is right now, Women’s Nutrition Connection gives you personal access to the “magic bullet” of exercise. Don’t be surprised if your weight starts to go down, your energy picks up, and you get a nice rosy glow with your very first issue. PUT YOUR HEALTH IN THE HANDS OF EXPERTS AT WEILL CORNELL MEDICAL COLLEGE. Now, no matter where you live, you can have the amazing benefit of the latest research, the newest discoveries, the considered medical opinions of the top specialists in women’s health. For over a century, Weill Cornell Medical College has been a pioneer in healthcare especially for women. How committed are they? Weill Cornell was among the first medical schools to admit women as students . . . the very first to hire a woman professor of medicine . . . and the first to admit a class of med students in which women outnumbered men. At a time when women’s health often took a backseat, Weill Cornell made important advances. The “Pap Test” for cervical cancer was invented here by Dr. George Papanicolaou. The Iris Cantor Women’s Health Center debuted at Weill Cornell Medical College in 1994 . . . followed by the Women’s Sports Medicine Center, The Calcium Information Center, and many other programs of special importance to women. Now you can take full advantage of Weill Cornell’s longtime focus on women’s health every month in Women’s Nutrition Connection. You get all the insights you’d expect from a top tier institution . . . delivered in down-to-earth language with action items you can put to work in your life right away. For instance . . .
“SUPERMARKET SLEUTH” TAKES THE GUESSWORK OUT OF SMART EATING. If you’re ever confused about food labels – what’s really healthy and what just sounds healthy . . . If you’d love to make smart choices at chain restaurants, even fast food drive-throughs . . .
At last you’ll know . . . Which breakfast cereals really are whole grain. If vegetarian foods are healthier. Holiday pies that take the “ho ho ho” right out of your dinner. Which organic foods are really worth your money. Frozen pizza you can feel good about. Salad bar specials to steer clear of. Which deli sandwiches to dodge and better ones to bite into. Skinny dips for snack attacks. Best bets at the farmer’s market. And so much more. START YOUR RISK-FREE SUBSCRIPTION TODAY! Click here and complete the form and your subscription will begin immediately. I’ll send you the next 12 informative issues of Women’s Nutrition Connection absolutely risk-free. I think you’ll be amazed at what you learn. And how easy it is to make healthy changes in your life. In fact, I’ll go even further and promise you’ll discover exciting new ways to improve how you feel, how you heal, how you age, how you look, and how much energy you have all day long. But you needn’t take my word for it. Your opinion is the only one that matters. So start your subscription now and see what you think. If you don’t agree that Women’s Nutrition Connection opens your eyes to a longer, healthier life, no problem. Just write, email or call at any time during your subscription and we’ll be happy to refund you your entire subscription payment. See why so many smart, healthy women in the prime of life rely on Women’s Nutrition Connection. Start subscribing today!